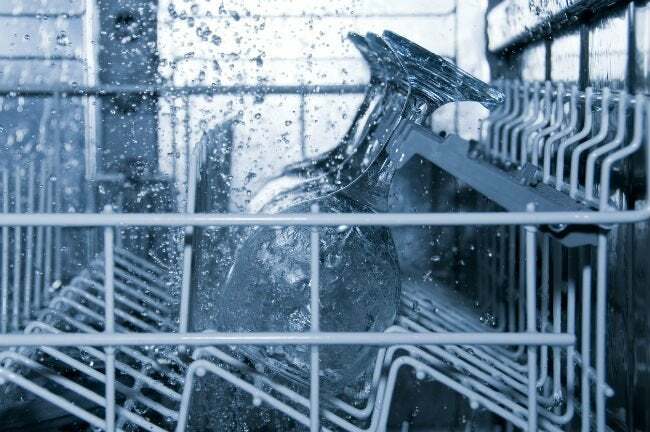 If you've opened your dishwasher to find a sudsy puddle on along the bottom of the appliance, follow these troubleshooting tips to take care of the underlying problem yourself. Q: I opened the dishwasher door to find the bottom of the unit filled with dingy water! My first thought was that the cycle didn’t complete so I ran the dishwasher again—but that didn’t do the trick. Why is my dishwasher not draining? Any ideas for a do-it-yourself fix, or must I call a plumber? A: You did the right thing running your unit a second time. If a dishwasher gets inadvertently shut off during a cycle, there’ll be standing water in the bottom when you open it. When that smart move doesn’t solve the issue, the problem lies elsewhere. Dishwasher service calls are common in the plumbing industry, but fortunately, the fix to a dishwasher not draining is often something simple you can do yourself. So before you call a pro, troubleshoot your dishwasher using the following steps. Run your garbage disposal. The drain hose from your dishwasher empties into the garbage disposal drain. If the disposal unit contains unground food, or if food sludge settles in the drainpipe below the disposal, it can prevent the dishwasher from draining properly. Sometimes, just running the disposal is all it takes to get the dishwasher draining again. In fact, get in the habit of leaving the water on and letting your garbage disposal run an additional 15 seconds after the food is gone. This clears all remaining food that might otherwise remain in the P-trap drain beneath the disposal. Clean your sink’s air gap. When a dishwasher hose connects to a sink without a garbage disposal, an air gap—a small, slotted cylinder (often made of stainless steel)—is installed on the top of the sink, right by the faucet. A small hose from the air gap connects to the dishwasher’s drain hose. This acts as a vent to prevent an air lock from forming in the drain hose, but occasionally, the air gap can become clogged with debris. To investigate, twist the air gap counterclockwise to remove it, and check it for gunk. Clean the air gap with water and a stiff brush, replace it, and run the dishwasher cycle again. Remove standing water. If running the disposal doesn’t help (or if you don’t have one), it’s time to drain the water to allow a closer look at possible culprits. Place absorbent towels around the base of the dishwasher and then remove the bottom dish tray by simply sliding it out. With the tray out of the way, use a plastic cup to scoop the dirty water into a bucket for disposal. When the water level is too low to scoop, use towels to sop up the last bit in the bottom of the machine. Clear up detergent mishaps. Dishwashers are designed for use with automatic dishwasher detergents that clean without producing suds. In the course of a hectic day, it’s easy to accidentally squirt regular dishwashing liquid into the unit, which can easily create enough suds to prevent proper draining. The same problem can occur if you run out of automatic dishwasher detergent and substitute laundry detergent in a pinch. Guilty as charged? Simply bail out the tub as described above, and run the cycle again, this time using the correct detergent. De-gunk the drain basket. The drain basket is found at the bottom of your dishwasher’s interior. Its cover often resembles an upside-down basket, which either snaps off or is held in place by one or two screws. (If the bottom of your machine doesn’t look like this, consult your owner’s manual—which you can often download from the manufacturer’s website). Remove the cover, and check for food buildup in the basket beneath. Use your hand or a spoon to remove any debris, replace the cover, and run the dishwashing cycle again. Note: If you find a lot of food debris in the drain basket, prevent future clogs by pre-rinsing your dishes. Most dishwashers manufactured today feature macerators that grind bits of soft wet food, but they don’t have nearly the power of a garbage disposal. So even if your machine says you needn’t pre-rinse the dishes, do so anyway to avoid repeatedly cleaning the drain basket. Examine the drain hose for clogs. If the hose isn’t kinked, it could still be clogged with food sludge or debris. To check for a clog, you’ll need to remove the lower front panel and locate the spot where the ribbed hose attaches to the drain pump. First, unplug the dishwasher: While you shouldn’t come in contact with any wiring, the general safety rule when working on appliances is to unplug them first. Then place old towels under the unit and remove the lower front panel. Many panels snap off but, depending on your model, you may have to remove a screw or two. Disconnect the hose from the pump (if you’re unsure where it is or how to disconnect it, consult your owner’s manual). To check the hose for clogs, simply blow through it. If air won’t pass through, you’ve got a clog. If the clog is located at either end of the hose, you can try to carefully remove it with a screwdriver or other thin implement, like a straightened out wire coat hanger. If the clog is not located near the end connected to the pump, remove the hose where it connects to the garbage disposal or air cap to check for a clog on that end. If the clog is lodged deeper, you’ll probably have to replace the entire hose. Don’t try to clear the clog with a plumber’s snake—dishwasher hoses aren’t designed to withstand that tool’s cutting motion and can be easily punctured. Replace the drain hose. For recurring kinks or a clog that you can’t remove, replace the entire hose. Call a plumber if you’re not comfortable trying this yourself. A pro could easily charge a minimum of $150 for a house call, so you’d save a bundle handling the job yourself. This involves unplugging the unit and sliding it out from under the countertop. Then, disconnect the old hose from both the pump and the garbage disposal (or the air gap), and attach the new one in the same manner. Consult your owner’s manual first to ensure that you purchase the correct replacement hose, and for any specific instructions on how it attaches to your model. Call the plumber. Most of the time, when faced with a dishwasher not draining, one of the above techniques will help. But if you tried to no avail, the problem could lie in a faulty pump or in the dishwasher’s timer or motherboard. Replacing these specialty parts should only be done by a licensed plumber, so if you’re in that situation, call a pro.